Available in black (like the PR photo at left) or silver (like our review unit), the 204T offers 1,600 by 1,200 resolution, with no bad pixels to be seen on our screen. That's the familiar 4:3 aspect ratio instead of the increasingly popular widescreen view, but it's a nice step up from the 1,280 by 1,024 resolution of almost all 17- and 19-inch desktop LCDs. Spreadsheet jockeys can see a whole year's worth of columns; Photoshop fans can zoom in on the finest details; desktop publishers can admire a two-page spread (although close editing at that zoom level arguably demands an even larger display). Word processing buffs and Web surfers can see a whole page as well, since the Samsung pivots between landscape and portrait (horizontal and vertical) orientation. In addition to pivoting, the 204T's simple, handsome stand provides smooth tilt and swivel adjustments -- the latter is somewhat rare among LCD monitors, which are usually light enough to be swiveled or repositioned base and all. Pushing a release button or latch at the rear of the stand also lets you tug or shove the panel up or down for height adjustment, although the latch only locks into place at the lowest setting. The monitor's bezel is thin enough (a fraction under 0.75 inch) to permit tiling or side-by-side placement, if you can afford and your PC's graphics adapter can work with two monitors. It measures roughly 18 by 18 by 9 inches and weighs 18 pounds. To help keep your workspace tidy, the Samsung's power supply is built in rather than a notebook-PC-style power brick. Samsung's Web site says the monitor draws a maximum of 63 watts in operation; the Adobe Acrobat owner's-manual file adds that the display drops to 2 watts in standby or screen-saver mode and -- in what seems to be a historic achievement in energy conservation -- "less than 0w" when turned off. 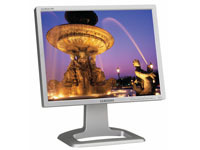 The SyncMaster 204T has both analog (VGA) and digital (DVI) inputs, with cables for each included in the box; one button on the front bezel lets you switch between the two (but not select a picture-in-picture view), while another provides one-touch automatic adjustment of display settings for an optimum view with analog input.